60 x 542mg Veg. Caps. Each vegetable capsule contains 170mg of Beta Glucan 1,3/1.6 and the equivalent to 501mg Raw Propolis , 90mg Calcium Citrate, 90mg Calcium carbonate and 25mg Magnesium citrate. 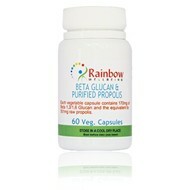 Beta Glucan is an all-natural substance derived from the cell walls of Baker's Yeast. It is a unique compound that intensifies the effectiveness of the body's immune system by activating specific white blood cells. These key cells are produced in the bone marrow and circulate throughout the body where they consume whatever foreign invaders they encounter. Cells involved in the immune response originate from stem cells originating from bone marrow. New cells from bone marrow are produced on an ongoing basis throughout the life cycle. However, the formation and migration of newly formed white immune cells that can promote or produce antibodies is limited and declines with ageing. 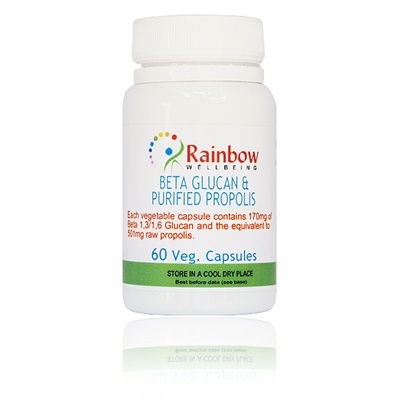 Beta Glucan nutritionally stimulates the production of needed precursor cells in bone marrow, yielding an increased flow of immunocytes into the bloody stream and the various lymphoid organs.